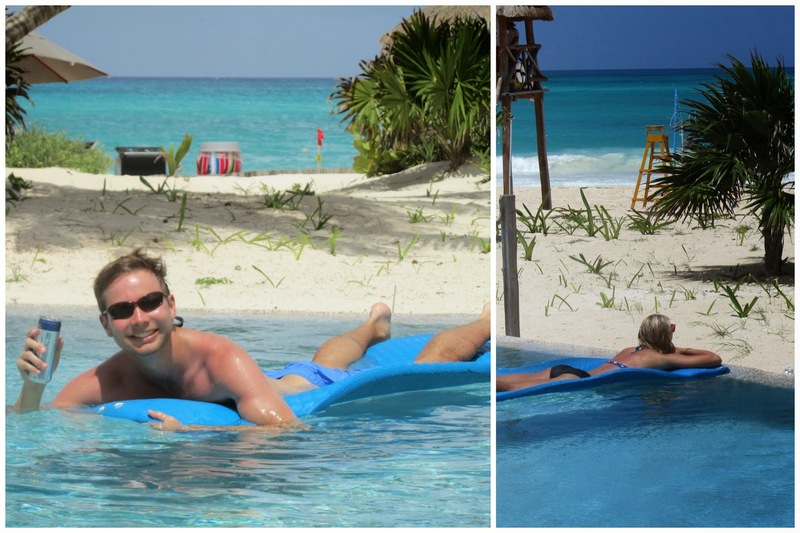 I thought it might be fun to share some before the blog moments... starting with one of my favorites - our honeymoon! John and I left for our honeymoon two days after our wedding. We much preferred it that way (as opposed to leaving the very next day) so that we could spend time with family and friends that were in town the day after the wedding. When we first got to the resort, it was a bit cloudy out, and we made the biggest rookie mistake possible... fell asleep outside. Although it was cloudy, we got quite a bit of sun. I was okay, but John on the other hand was fried to a crisp (and we had only been there a few hours!). The poor guy was so burned that his skin started to blister. He was quite uncomfortable (as you can imagine), and by the end of the trip he had completely peeled (and then reburned). We affectionately coined ourselves Mr. and Mrs. Lobster. Honestly, we spent the majority of our vacation enjoying the water, drinking fruity drinks, and over indulging in food. We planned a snorkeling trip and went deep sea fishing with another couple, and it was quite fun. The couple we went with became sea sick when fishing, and it dampened the mood a bit, but hey, more fishies for us! John also (not surprisingly at all) participated in a trivia tournament and won. If you know John at all, this shouldn't be shocking. Our room had a serpentine pool off of the patio, and after about noon the pool was shaded from the sun- this ended up being a great way to enjoy the water without having to be in the burning heat (for John and his burn's sake). My groom and I had such a great time, and I cannot waitttt to go on a "real" vacation sometime soon again (and by "real" I mean ocean, fruity drinks, and way too much food... and for at least a week!). You can read about how John and I met here. How we got engaged here. How beautiful and what a perfect honeymoon! Why can't honeymoons should be a yearly thing?! OMG!! I love the tshirts!! So cute!! Poor John! That would totally happen to me!! He looks like he handled it like a champ though! Those shirts are so cute, love them! Y'all look like you enjoyed your honeymoon, for sure! Those honeymoon shirts are so adorable! Hope you guys will be able to plan a return trip soon (with less burning this time!). This is a great idea! We had quite a bit happen "before the blog" too. This makes me miss our honeymoon so, so much. I think you're right, it's never really long enough. We agreed we will go back again for one of our milestone anniversaries, but definitely hoping to get back for a beach vacation before then! Wow, you guys did get some sun! Sounds like you were still able to enjoy it! There aren't many things better than having a fruity drink in your hand and your toes in the sand! Your honeymoon looks like it was fantastic! I always get burned to a crisp no matter how much sunscreen i put on so I feel your pain! Looks like you guys had a great time, despite turning into lobsters! "Real" vacations are NEVER long enough! I love thinking of the blog as a online scrapbook, what a great tool! 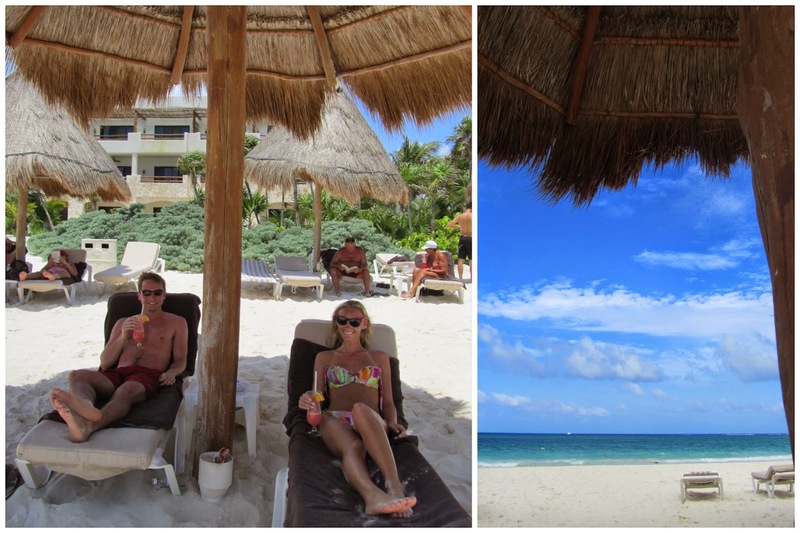 "enjoying the water, drinking fruity drinks, and over indulging in food"
literally every honeymoon's dream. love it!! This is the perfect honeymoon! Well, besides the sunburns haha relaxing on the beach with food + drinks... ahhh sounds amazing! We went to Hawaii and the sun was SO strong, poor Nick just got sunburn on top of sunburn every single day! How cute is this?!?! I love those shirts at the top - so different! How sweet is this post! You two are adorable! That has happened to me! Sunburn is the WORST! Your vacation looks amazing though! This was so sweet! And what a great idea, love the before moments. You guys are just too cute!! AHHH what a fantastic honeymoon and I am loving your tee shirts - too cute!! We left a few days after our wedding too - there is just something so great about spending more time with family after the craziness of the wedding! love this and these photos!! So much fun and love those t-shirts ya'll have!! How fun! My husband and I have looked into going to a Secrets resort, but I haven't heard much about them. This was perfect timing! Love your Just Married shirts - too cute! aww bummer you got burned immediately upon arrival! Ouch. But lots of relaxing, fruity drinks, and plenty of food - that sounds really great! I love the back story posts! This looks like such a great honeymoon!! Such a pretty honeymoon! I went deep sea fishing in Mexico once and I was SOoooo sick! It sucked! Lol.